What can I say about raisins? They are delicious and ubiquitous. Once, in Kindergarden or maybe earlier, we made raisins by setting grapes out in the sun in the morning. By the end of school, we had raisins. I can’t recall anything about how they tasted, but I distinctly remember being impressed both by the sun’s capacity to transform a grape into a raisin while I learned to enumerate barnyard animals and by the ability, as a child, to make food. So raisins might be the first thing that got me cooking. That’s fitting in a way, because I continue to be impressed by all that raisins can do. I put raisins in my oatmeal. I’ve used them to stuff a turkey. One of my favorite uses of raisins is in Moroccan Tagine Chicken, where they come together with honey and at least a half-dozen spices for a spicy and sweet dish. I adapted this for this for grilling by using the sauce as a marinade for thin, quick-cooking pieces of chicken. 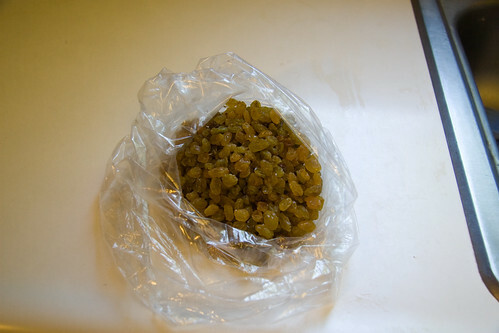 While the raisins cooked, I pounded chicken breasts—four pounds of them— to a thickness of about 1/2″. After the raisins had plumped some and the water was reduced by about half, I purÃ©ed the raisins with the water in a food processor. 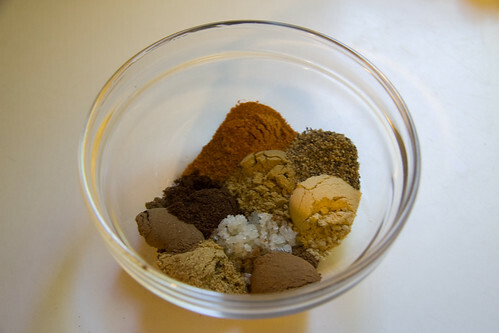 I then returned the mixture to the saucepan and prepared a Moroccan spice mix (Ras-el-hanout) of salt, pepper, cayenne, cumin, ginger, coriander, cinnamon, allspice and cloves. I started with this recipe, but added additional cayenne, cumin, black pepper and coriander. 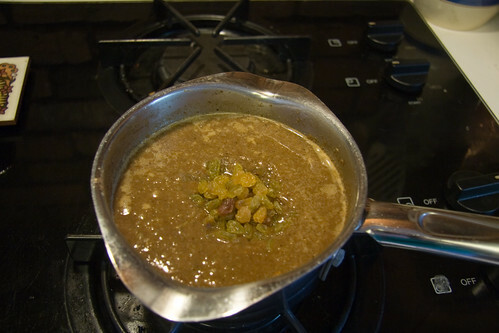 I mixed the spices into the raisin purÃ©e, then added another cup of water and an additional 1/4 cup of whole raisins. I let this cook over low heat for about 30 minutes before stirring in a two tablespoons of olive oil and leaving it to cool for another 20 minutes or so. 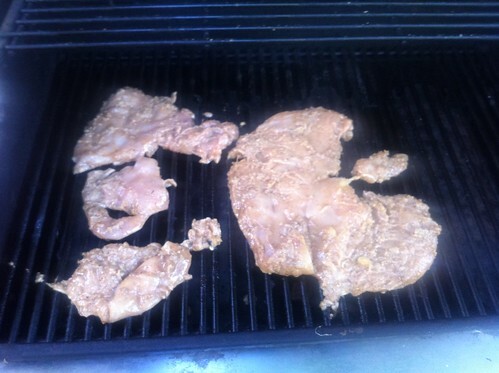 I poured it over the chicken, making sure each piece was well covered. 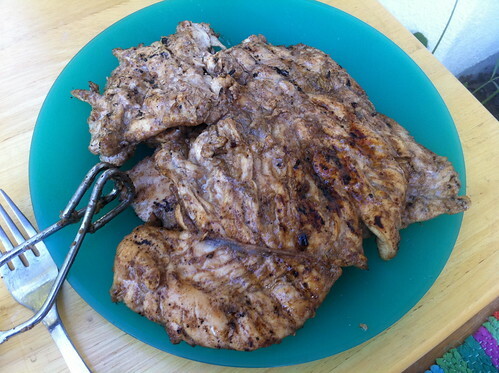 I let the chicken marinate for about two hours, before cooking it on a hot grill, about five minutes on each side. It came out tender, slightly sweet and richly spiced, with a nice kick from the cayenne. All four pounds were devoured very quickly. 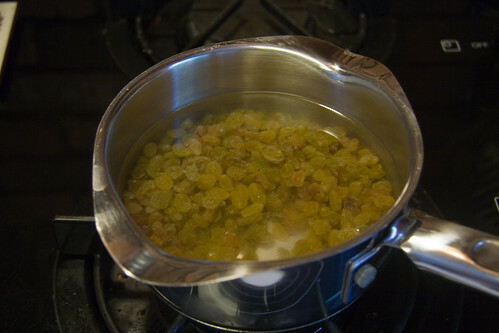 Cook 1 cup raisins and 2 cups water over medium heat until raisins are plump and water is reduced by about half. PurÃ©e raisins and water, then return to saucepan. 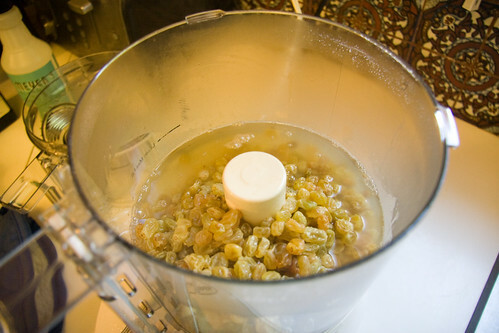 Add spices to raisin purÃ©e with additional 1/4 cup raisins and 1 cup water. Cook approximately 30 minutes. Add olive oil and let cool. 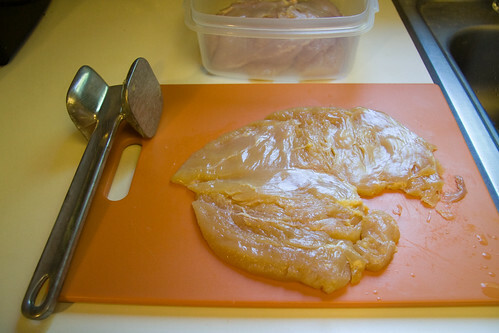 Pound chicken breasts to 1/2″ thickness. 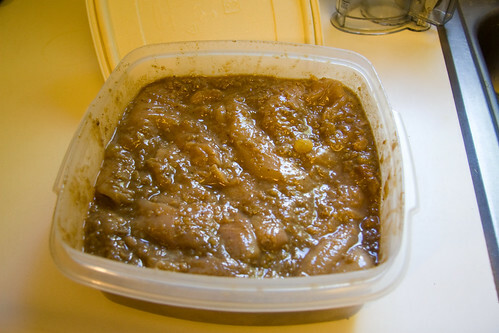 Cover with marinade. Let sit 2 hours. Grill over high heat for 5 minutes each side.